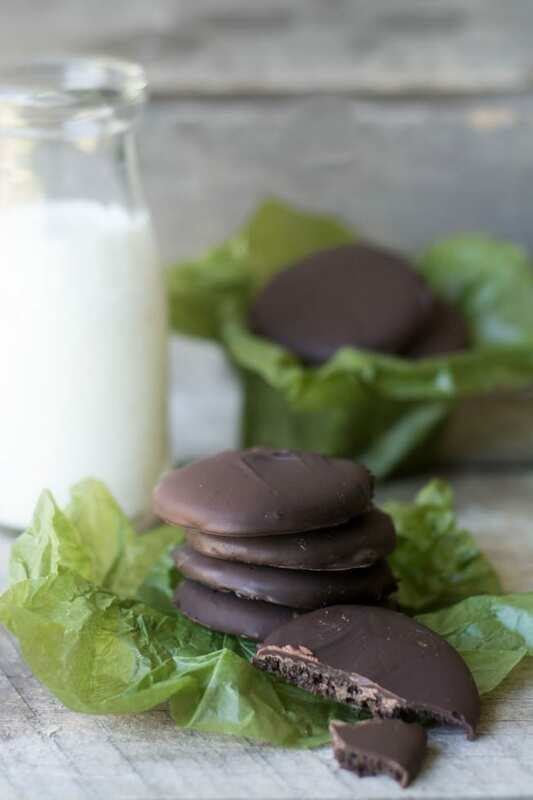 Gluten Free Thin Mint Cookies — because nobody should have to miss out on America’s favorite cookie — and this copy cat Girl Scout Cookie is even better than the original! 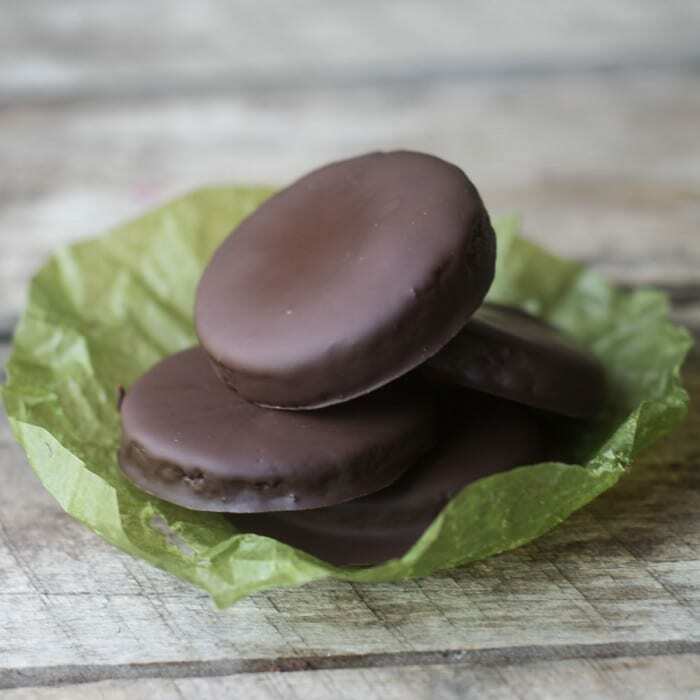 My Homemade Thin Mints is one of the most visited posts on my blog. That doesn’t surprise me at all, it’s such a rush to know you can recreate the most popular Girl Scout cookie right in the privacy of your own kitchen, with your own ingredients, any time you feel like it. 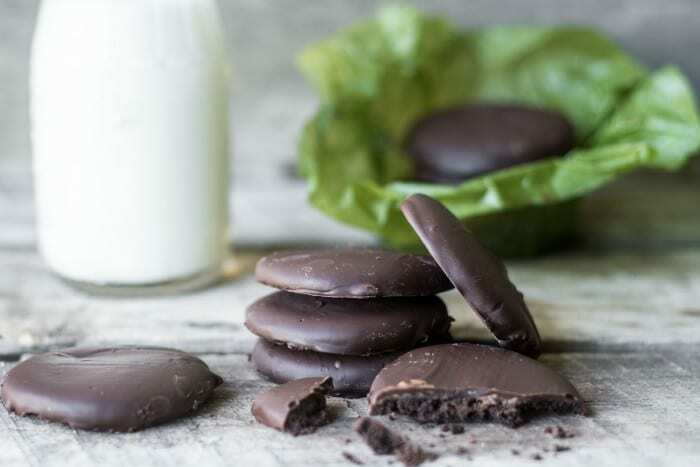 Using your own ingredients is key — did you know that, at least these days, the Girl Scout Thin Mints contain no butter or chocolate at all — they’re made with vegetable oil, shortening, and high fructose corn syrup. Oh, and a touch of artificial flavor. I’ll take my version, thanks. 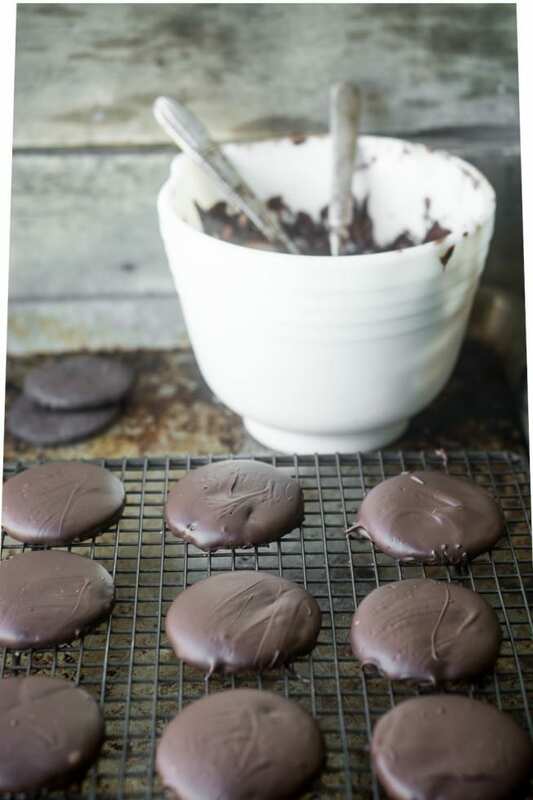 And now even gluten free eaters can get in on the action with these amazing gluten free Thin Mint cookies. 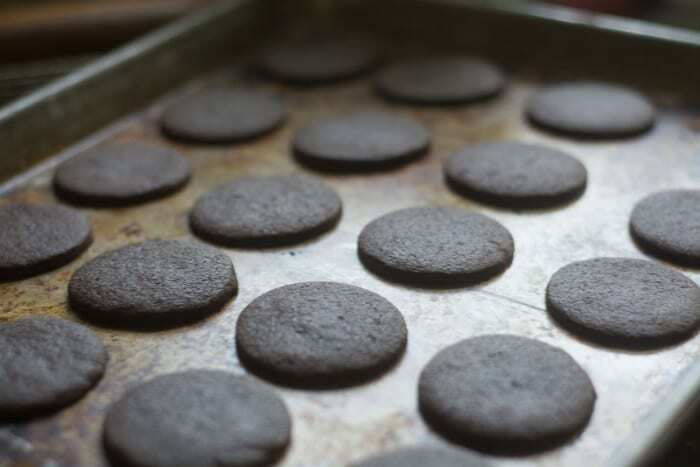 The inspiration for these gluten free Thin Mint cookies came from one of my readers — she said she made my regular Homemade Thin Mints with gluten free flour and they turned out fantastic, so I tried it for myself and I agree — thanks Kelly! These cookies are made exactly like my originals, except that I replaced the flour with a gluten free mix. Mine is from Bob’s Red Mill I’m happy to report that the difference is minimal. The gluten free version has a little bit less crunch due to the lack of gluten, but some people might actually prefer that, and I didn’t think it made much of a difference either way. The dough comes together easily and after a quick chill, rolls out to a 1/8 inch thickness on a floured board. You can make the cookies ahead of time if you like. 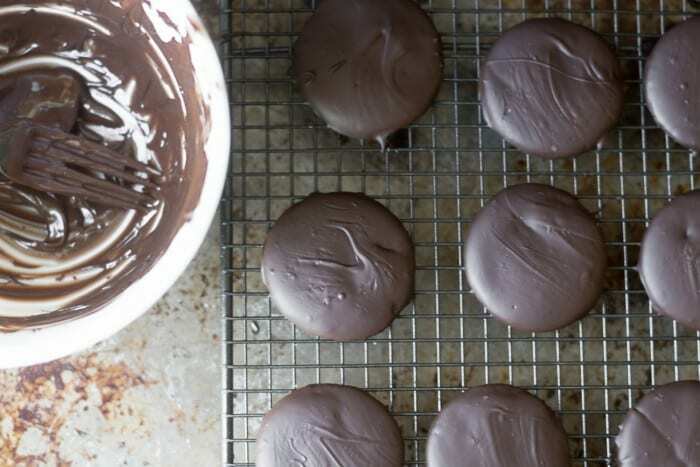 For me the true beauty of a Thin Mint is in the pepperminty chocolate coating, and it’s here that the homemade version outshines the mass produced a hundred to one. Using your own chocolate makes such a big difference, and really just about any chocolate you use to coat your cookies is going to be higher quality than what is on the mass produced cookies. That’s just one of the perks of doing it yourself :) You can use chocolate chips or baking chocolate. I found baking chocolate (aka Baker’s Chocolate squares) works best if you want a smooth even coating. if you just love chocolate and like a thick layer on your cookies, chocolate chips work fine too. Cream the butter and powdered sugar in the bowl of a stand mixer until fluffy. Beat in the salt, vanilla, and cocoa powder. Blend in the flour and combine until fully mixed. Turn the dough out onto a floured board and bring together into a flat disk. Wrap in plastic wrap and put in the freezer for 15 minutes. Don't leave it in longer than 15 minutes or it will be too stiff to roll out. Roll out the dough on a floured surface to about 1/8 --- 1/4 inch, depending on how thick you like your cookies. Keep the dough moving on the board to prevent sticking. 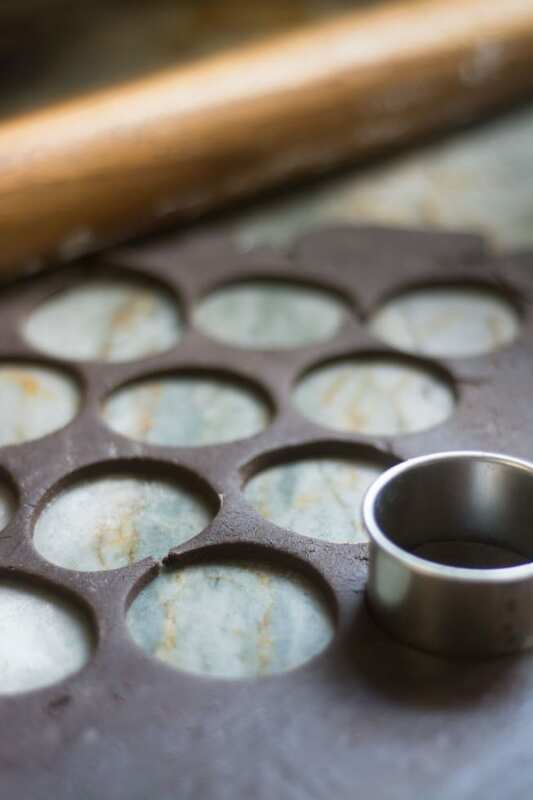 Cut out cookies with a 2" cookie cutter. Place on an unreleased cookie sheet and bake for 10 minutes. Cool the cookies completely on a rack before coating. Melt the chocolate and vegetable oil in a microwave safe bowl for one minute. Remove and stir to melt. Add another 30 seconds if necessary. Stir until the chocolate is smooth and silky. Sometimes it helps to let the hot chocolate sit for a minute to completely melt all the little lumps. Add the peppermint oil and stir again. If the chocolate seems too thick, add a touch more vegetable oil and microwave another 15 seconds. Dip each cookie into the chocolate head first, then flip, and remove using a fork to balance the cookie. Gently rap the handle of the fork against the side of the bowl several times to let the excess chocolate drip off. Set the cookies on a parchment lined surface to firm up. I like to set them in the fridge to completely harden. Store the cookies in the refrigerator for best flavor. 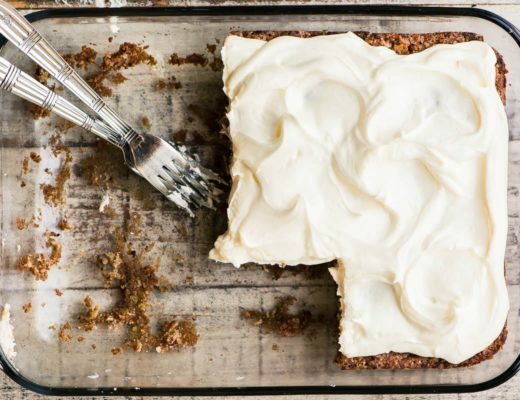 I used Bob’s Red Mill Gluten Free Baking Mix for this recipe. If you can’t find it at your supermarket, you can buy it on Amazon, HERE. Make sure your butter is truly at room temperature, if your butter is too cool your dough will not come together as it should. When melting chocolate, make sure all your bowls and implements are completely dry, even a little bit of water can cause the chocolate to ‘seize’ up and become a solid mass. Heat the chocolate gently and slowly until it melts and is thin enough to coat the cookies. You can use milk chocolate if you prefer. I like to melt the chocolate coating in 2 batches, that way if you get crumbs in the chocolate you can transition to a clean batch for the rest of the cookies. It is important to find peppermint oil or an extract that is oil based. Water, as I just mentioned, will make chocolate seize up. I used McCormick’s Peppermint Extract which does have a tiny amount of water in it, but it works for me. You can find food grade peppermint oil in large craft stores, cooking stores, and online HERE. Thin Mints are best eaten cold, so keep them in the fridge. Some people like them frozen, too. I wonder how coconut oil would do instead of butter in the dough? Have you ever tried? I haven’t tried that Sharin. I know technically you can do it, but I’m not sure what changes that would make in the cookie. No offense to Girl Scouts, but your thin mint cookies are much better! Real Butter and cocoa is what cookies should be made with! Pinning to try later! Must try this recipe! Looks super tasty! Love your website. These look amazing! They look just like the real thing! And do you know what’s even better? No eggs so if you’re dairy free or vegan all you have to do is switch out the butter with a dairy free substitute. Thank you! Oh, and furthermore? Yum. Thanks Laurel — at the risk of driving everyone crazy with thin mint recipes, I plan to post a vegan version soon! That’s even better. I think I just saw it but someone stole my name in the comments. I swear I had it first! Thanks for all your sharing, everything makes me drool whether I can eat it or not. Hi Sue, these cookies look so, so good! 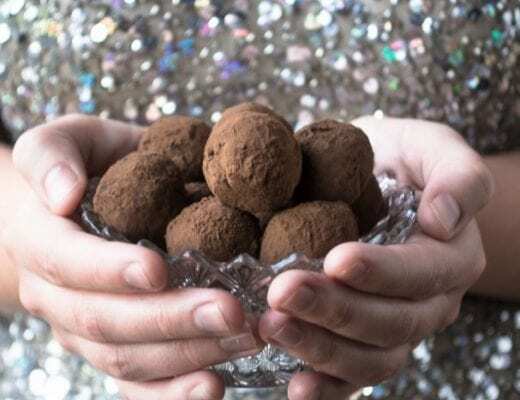 I cannot wait to share this recipe with my friend whose fighter has a severe wheat allergie – she is going to be so excited to make these for her gal. Thanks a bunch ? Amazing recipe sue – thanks for sharing !! I love these! But do you have a problem with the chocolate blooming or falling out of temper? I haven’t had it bloom, Jeff, in general I don’t find that a problem with the Bakers chocolate or the Nestle chips. What a great idea Sue. I know they’re infinitely better than the new fangled GS cookies! They would be a wonderful project to do with little ones! OMG I can’t believe my eyes. I love you and hate you at the same time because now I’m going to have to make these, my ALL TIME FAVORITE Girl Scout cookies. Guess who’s going to eat them all up? Yes , ME! I never saw your other ones so will be sure to catch that link and print it off as well. Of course since my 94 year old mom typically buys 10 boxes and freezes them I can surprise her as well with the homemade version. Honestly I had no idea they didn’t use chocolate anymore. I suppose it’s because I quit buying them since we would devour them so quickly then be disgusted with ourselves when our pants would all be too tight. Maybe I’ll just make these and save a few for my house and share the rest with everyone else. I’m excited!!! 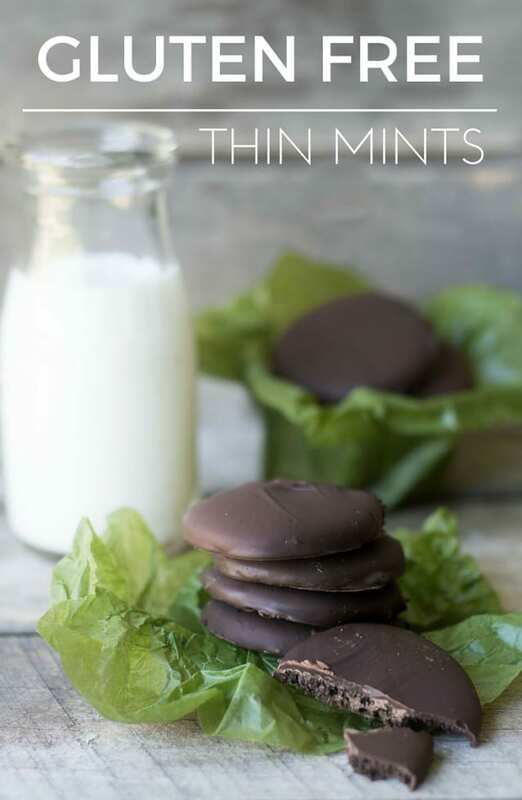 Homemade thin mints are the best these look fab! Chocolate and Mint….a true weakness for me, I just LOVE these! Sue, ever since I was a Girl Scout, I’ve been addicted to Thin Mints. Even after I stopped liking chocolate (sometime in my late 20s), I still liked Thin Mints and would eat a whole sleeve of them by myself once a year. Haven’t had them in several years now, but I’d like to make this gluten-free version for my chocolate-loving GF friends. OMG Sue! Only my favorite Girl Scout Cookie of all time! Need to try this recipe! I love these beauties crushed over ice cream! These look amazing! I love the bob’s red mill mix–I find it works really well in a lot of recipes. I’ve just started using it and like it too Jenny. Hi Sue, oh these are beautiful, making them for my daughter-in-law. My daughter is now eating gluten free, so I need to make some for her too! GF thin mints? Get outta here! What a GREAT idea. Sharing this with Mrs KR (the baker in our household) — I know just who we should make these for. :-) Really good — thanks. I just started eating gluten free and I can’t believe you posted these today, I was JUST complaining to my wife about not being able to gorge on Girl Scout cookies this year! Maybe I’m confused but the recipe as printed above contains butter and your comments said these cookies are also dairy-free. Should that be 1 cup shortening instead of butter? They look yummy. As I suspected. . I misunderstood. 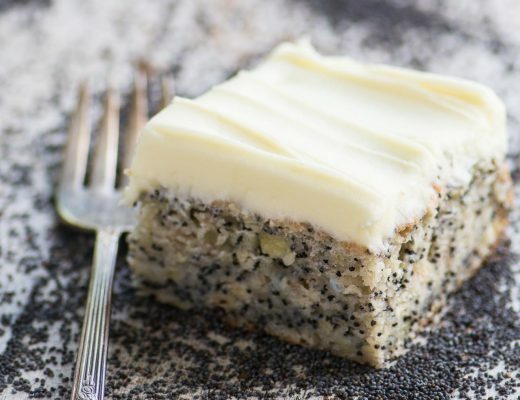 :) I have friends who cannot have gluten or dairy products and I thought I would make these for them but I will wait for a vegan version and see if you recommend them as well. Thank you! I think I’ll do the vegan version asap since it’s Girl Scout cookie season, Donna. Hope it helps you out. wow they turned out so perfect, Sue. Thanks Angie, I love Thin Mints, gluten free or not! NO BUTTER?? Girl scouts, what happened? I feel a little like I just found out Santa isn’t real—the shock! The disappointment! Thanks for saving the day with this homemade version, and I love that every one can enjoy! I think they’re trying to save money Erin, but they’re billing them as vegan. I think it’s just a reality of making anything on a large scale, the cost of quality ingredients is prohibitive.